Since kanbantool.com launch in late 2009, we have been making only small and gradual improvements to the kanban board design. This was good, but over time the technology has advanced and it was a high time to make bigger change to keep our boards pretty and appealing. The update is now live on all accounts, and I hope you will like it as much as we do! The design update brings a fresh new look to Kanban Boards. They are much lighter and more friendly than before. To keep things simple, we've decided to leave most of the navigation where it was before, making only small modifications. Starting from the top left, we have replaced the 'Dashboard' text with small home icon which takes you back to the dashboard. Next to it, you will find the current board name. Clicking on it will open the board switcher which you can use to switch between recently used boards. Exit taking you back to Dashboard. On the right, you will find links to feedback, tools menu and the searchbox. Tools menu has some goodies inside. From it you can: subscribe to RSS to stay posted about any changes on the board, import or export cards to Excel or CSV, send tasks with due dates to calendars (Outlook / iCal / Google or other) or even generate email address which you can use to add tasks from email. There is also a link to our express Kanban board tutorial. Search box allows you to search for card titles, card types, tags, assignees, task ID and custom fields. 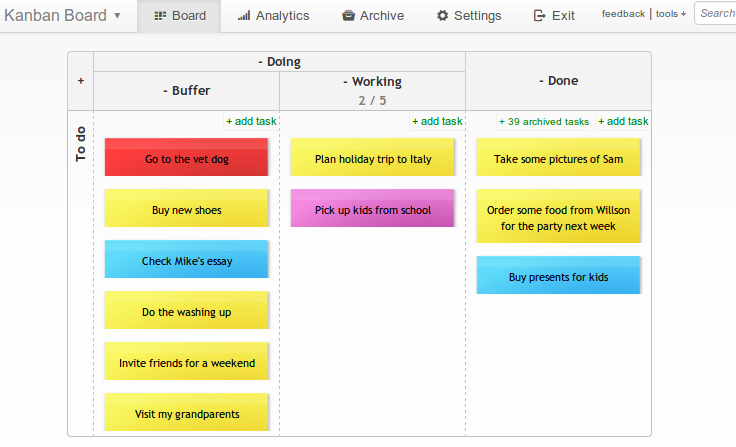 With Kanban Tool, you can now fully focus on getting things done instead of managing your work. As well as the above highlights, we have added a small but useful feature: You can enter numeric values (like revenue, cost, age etc.) in custom fields and generate reports basing on that. We hope you like our new design! Please feel free to send us your comments and suggestions. We are happy to receive your feedback.